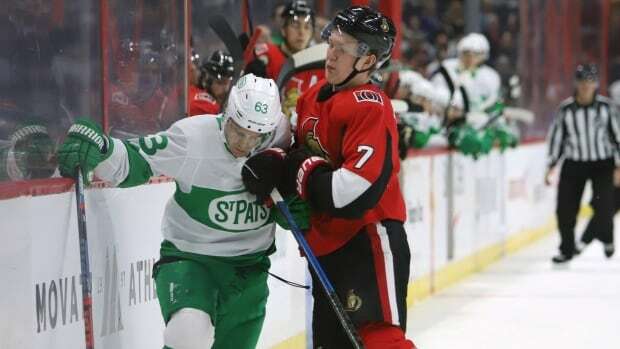 Magnus Paajarvi scored two goals to lead the last-place Ottawa Senators to a 6-2 win over the slumping Toronto Maple Leafs on Saturday night in Ottawa. Cody Ceci, Brian Gibbons, Anthony Duclair and Oscar Lindberg also scored for Ottawa (25-41-6). Anders Nilsson made 35 saves. Morgan Rielly and John Tavares scored for the Leafs (43-24-5), who have lost three of their past four games. Garret Sparks stopped 38 shots. The Leafs should have felt right at home at the Canadian Tire Centre with most of a season-high crowd of 18,607 cheering for Toronto in the Battle of Ontario. Trailing 4-1 to start the third, Toronto caught a break when both Zack Smith and Mark Borowiecki took minor penalties, giving the Leafs a two-minute, two-man advantage. Tavares managed to score to cut the lead in half, but not until there were just 14 seconds remaining on the power play. Ottawa regained its three-goal lead shortly after as Duclair tracked a shot off the back boards and slid it past Sparks. Lindberg capped the scoring.